Due to technical difficulties last week, I'm announcing winners for two weeks today. Thanks to everyone for your patience. 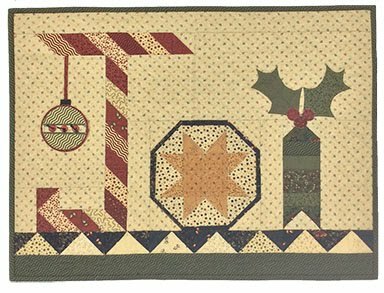 Marie Chat - What a cute and creative pattern using your new Thistle fabric line. Looking forward to the Moda Blockhead project. The name reminds me of my childhood and my brothers! jane nj/wi -Your thistles are much gentler than the ones I had to pull as a kid in our pastures. 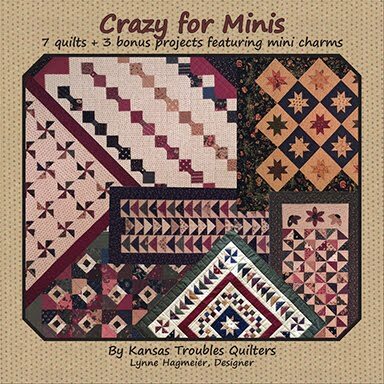 Clever and fun piecing. Since Thistle Farm is our spring group, it includes the ever popular KT plum/purple we receive so many requests for each year. Yum! 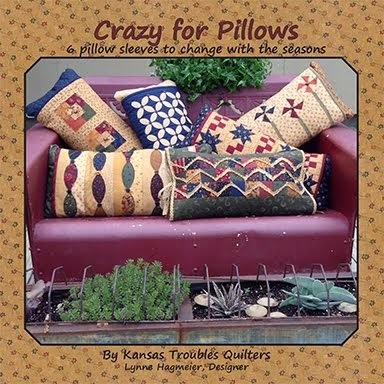 I've shared the thistle-inspired projects over the past couple of weeks. 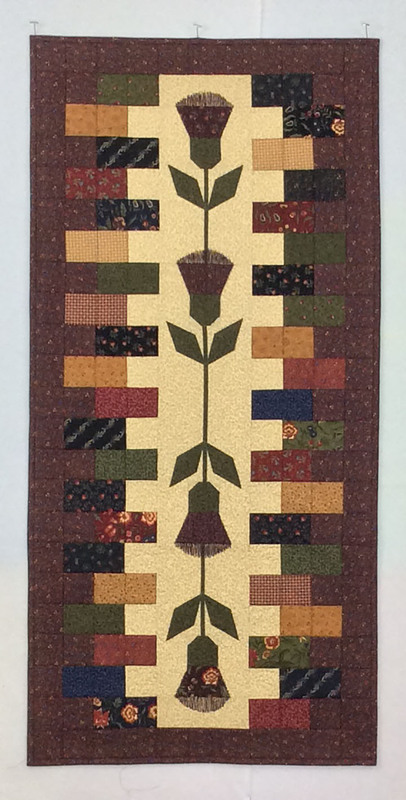 Now I'd like to show you the block that inspired the thistle block - a layered patchwork version of a tumbler. Here's the front of a strip of tumbler blocks showing the layered & topstitched triangles on adjoining squares. I first laid out a red square, blue rectangle, gold square, tan rectangle, green square in a row. Next, I laid matching triangles cut from a rectangle, similar to last weeks thistle tops, on the squares next to to it. A little glue, a little topstitching, and we're in business. Here's the back, showing how easy it is to sew a strip together with simple squares and rectangles. 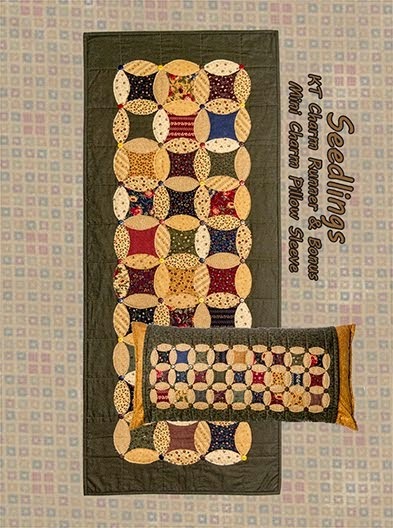 No stitching on bias edges so your rows are perfectly straight. Tah-dah! Need a faster project? 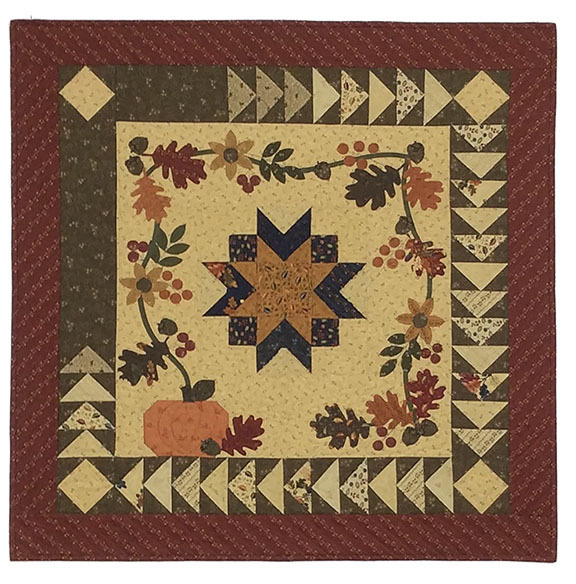 A couple charm packs make a nice sized runner by simply turning the triangles. 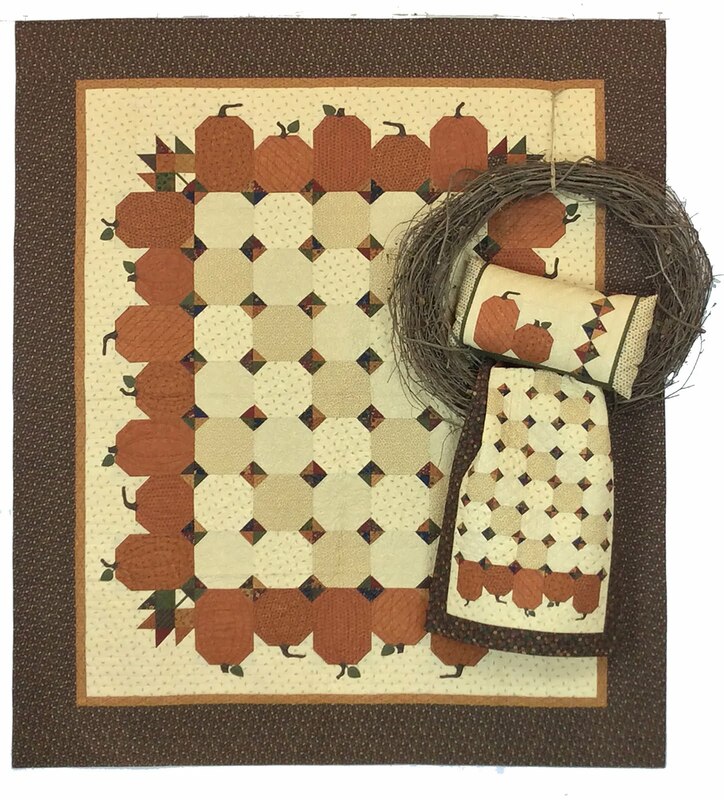 We used 2 Thistle Farm charm packs for this runner, but charms from 2 different fabric lines makes it scrappier. With all this topstitching, what kind of thread should you use? My tan go-to color is Aurifil #2326 for most piecing and my bobbin. 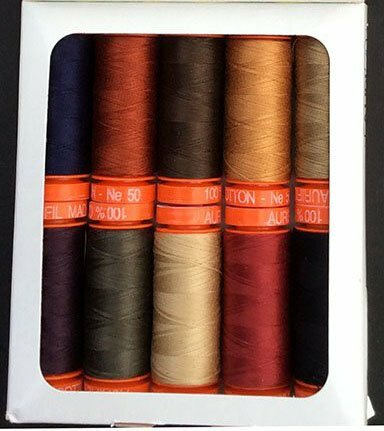 My favorite for topstitching is Aurifil 50wt. color #5013 green/gray. It blends with virtually all KT colors so you don't have to switch up threads on a scrappy project. To make it really easy for you to try it out, check out our March Special. 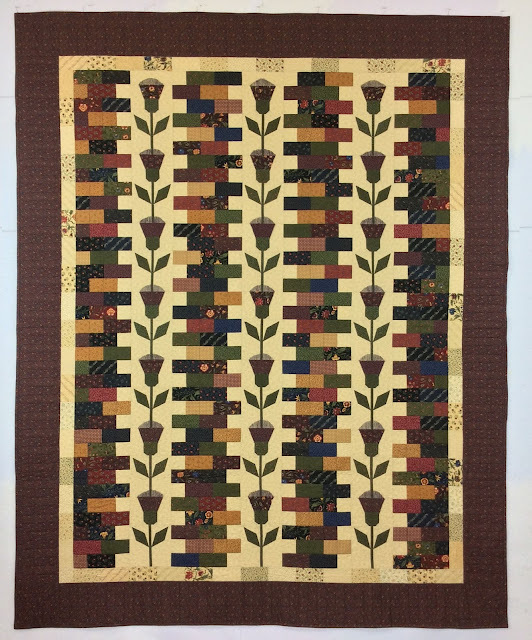 With the new Thistle Farm projects, I used a variety of colors to stitch the different colors of thistle tops, leaves and tumblers - purple, red, gold, green. The best to buy this selection is in my KT Aurifil Thread Box of 10 colors to match KT fabrics. A 220yd. spool of 50wt. Aurifil is regularly $5 - and a good value at that. 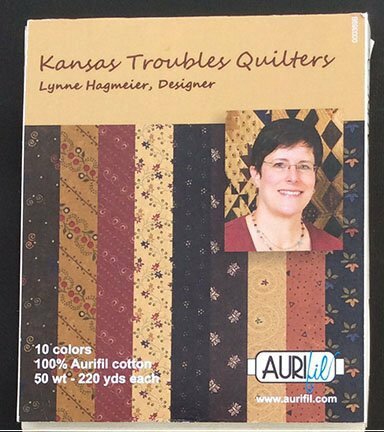 This month, our Aurifil 220yd. 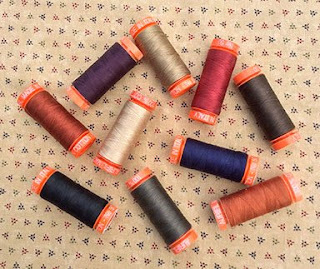 spools are only $3.50 each and the KT box of 10 different colors is only $30! That's a savings of $20 off suggested retail. Wow! Now is the time to stock up before the Moda Blockheads BOW begins. Comment this week to win an assortment of (4) spools of Aurifil thread - tan, green, red, purple. If you order before March 1st, our KT Templates are still 25% off for the February Special - score! 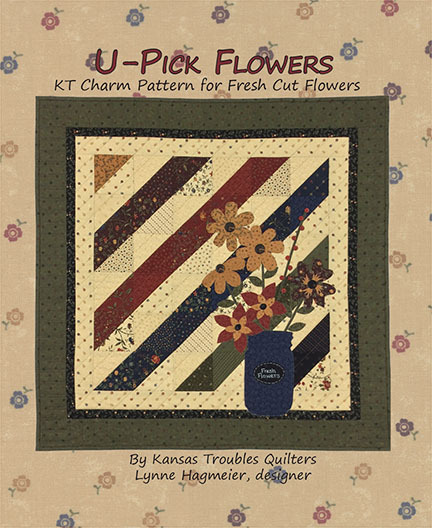 It's not too late to order a KT Starter Pack for the BOW beginning Wednesday, March 8th. I'll be blogging on Wednesdays now instead of Mondays to eliminate confusion about when the blocks will be posted. See you then! Get Ready for Moda Blockheads! We're still receiving/shipping orders every day for our KT Starter Packs. We're thrilled everyone is so excited about our Block-of-the-Week series. Just 2 more weeks until our first block is revealed. As a reminder, here are the facts. Six of us at Moda who favor warm, cozy colors (the dark side) are collaborating to bring you 8 unique blocks each. 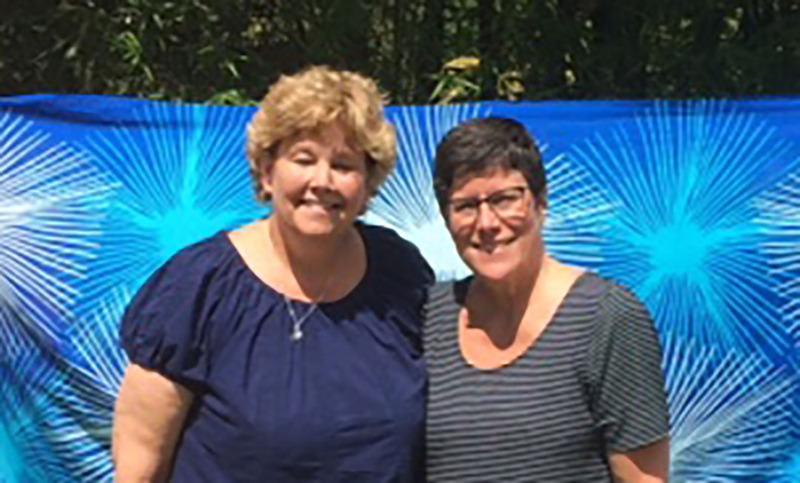 Joining me are Betsy Chutchian, Jo Morton, Jan Patek, Lisa Bongean & Carrie Nelson. Sign up at each blog (click on the name) for automatic emails each time one of these ladies posts their block. I will post a link right here on my blog to the designer-of-the-week on Wednesdays, beginning March 8th. Plus, I'm offering most of the blocks in my unique layered patchwork option, too, available right here. We'll have step-by-step instructions on how to simplify your block the KT way. So fun, you'll want to make both versions! Do I have to buy a Starter Pack to participate in the BOW? Absolutely not! 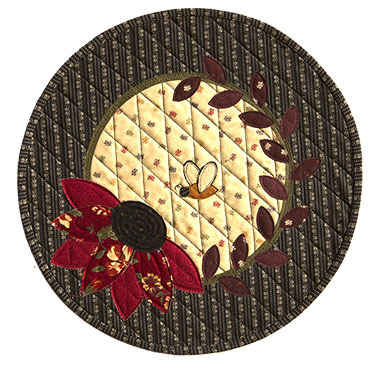 All patterns are free on the designer's blogs each week for you to download as you wish. We're offering the Starter Packs as an option to collect a variety of each designer's fabrics. Have a basket full of scraps perfect for 6" blocks? Great! We'd love to see how they look. 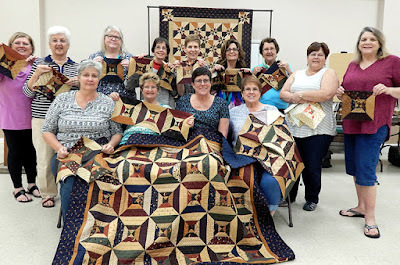 Post your finished blocks each week on Facebook with the hashtag #modablockheads. Our KT Starter Pack includes a total of (24) fat 16th's (9"x11" each) - 8 tans plus an assortment of (16) KT darks - for $18 plus postage. Find it on our website here. KTQ will be offering fat 1/8 packs of tans for backgrounds plus 6-packs of reds, navys, greens and assorted gold/purple/pumpkin/black in the coming weeks to add to your Starter Pack as you make blocks. 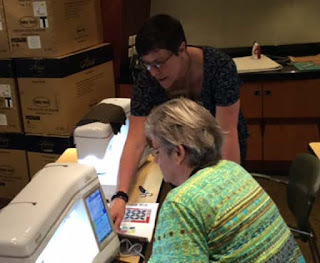 Two of my main piecers, Joy & Kathy, are making blocks ahead so we're ready to rock & roll when March 8 hits. They're coming out wonderfully! Kathy is making the blocks as each designer instructed in assorted fabrics from all the different collections. 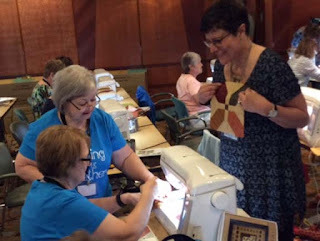 Joy is making the 48 blocks with my layered patchwork technique in KT fabrics. 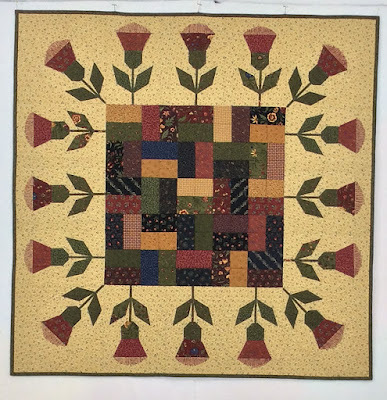 It'll be exciting to see all the blocks in two colorways and piecing techniques. You won't want to miss a week! See you next Wednesday. Dang, dang, double dang! I tried to shortcut this week's post by starting with last week's to cut/paste and totally lost it all! In the process, I lost all of your comments, too, so I can't select a winner this week. Pleeeaaase excuse my techo-ignorance. Comment again below and I'll give away the Thistle Farm charm pack along with this week's giveaway. Only a couple more weeks to prepare for our Moda Blockheads Block-of-the-Week. 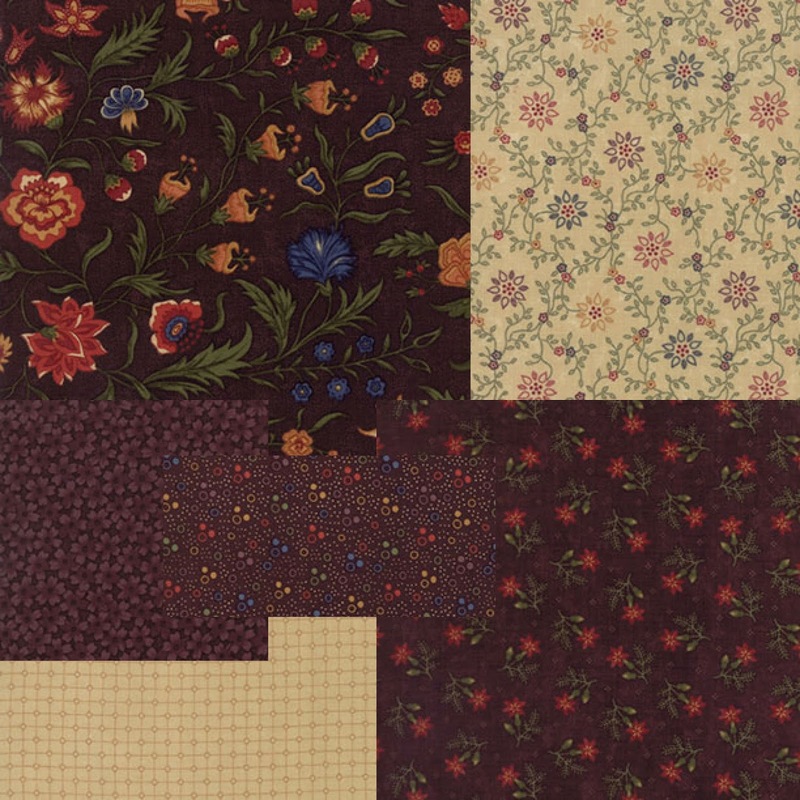 It's time to gather your fabrics - order a KT Starter Pack, check out the other Moda designers' starter pack options and dig into your scraps for the perfect complimentary pieces for our 6" blocks. Please comment with any questions you have and I'll reply through the weekly Wednesday posts. 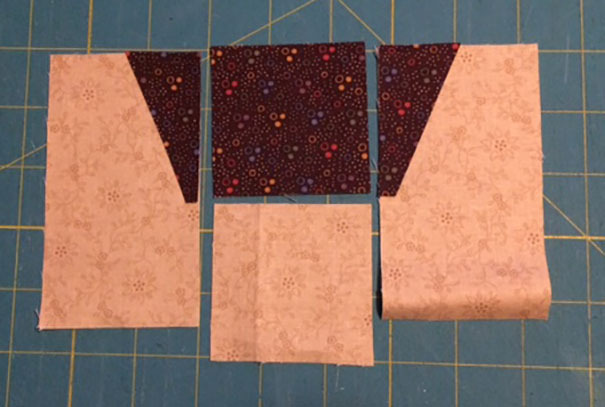 I have friends who trace and cut out tumbler blocks by hand while watching TV or traveling in the car, accumulating blocks for a future quilt project. I thought, there has to be an easier way make a scrappy tumbler quilt. 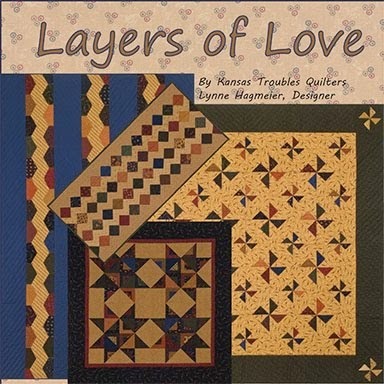 Of course there is with my layered patchwork technique! I've simplified a traditional tumbler block and used it to create these darling thistle flowers in our Thistle Farm booklet. 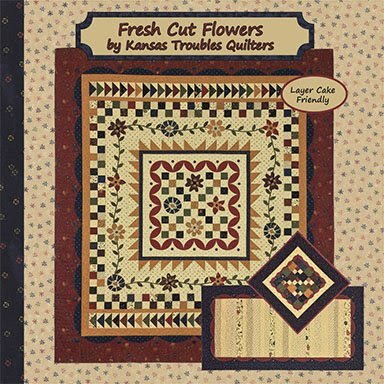 First, I cut a square plus 2 rectangles for each flower. The rectangles are cut diagonally, as shown, to create 2 triangles each. Then, I layered a purple triangle (one from each cut rectangle) on a tan background on either side of the flower square. Topstitch 1/8" from the bias edge of each purple triangle, sew the parts together and you have a super easy thistle flower. Blocks for Thistlewood table topper, below. The leaves are made with our small KT Diamond Template, which happens to be the February Special (all KT Templates 25% off). 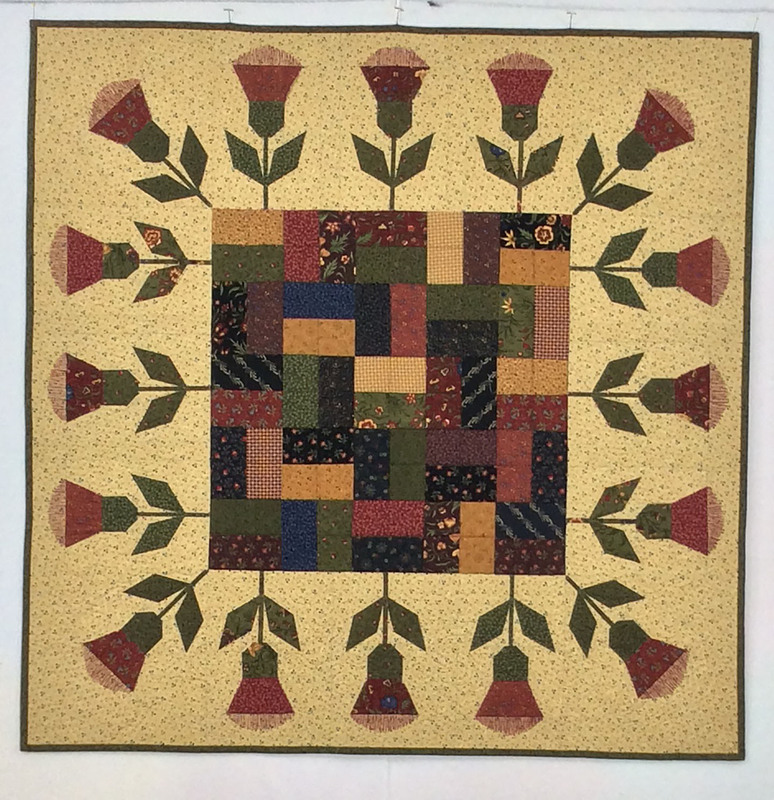 The spiky thistle tops are created while quilting with zigzag stitching in matching Aurifil thread - Purple #2570, Gold #2335, Red #2460, Green #5013. I'm thinking it might be a good time for a sale on purple (all) thread! Watch for our March Special in a few weeks. 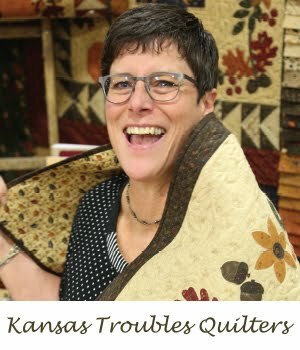 Next week, I'll share the tumbler quilts included in the Thistle Farm booklet using this technique. Comment this week with any questions you may have about the upcoming Moda Blockheads Block-of-the-Week series beginning March 8th. Or, anything else you have on your mind. You could win a Thistle Farm booklet this week. See you Wednesday! Blockheads BOW - Coming Soon! We're blown away by the response to our KT Starter Pack for the Blockheads BOW. Thanks to everyone who called or visited our website to prepare for the new series. Several callers had questions about our BOW. Over the next couple weeks, I'll try to answer your questions and make this the easiest BOW ever. A 48-week long series of one 6" block a week. Wednesday, March 8, 2017. 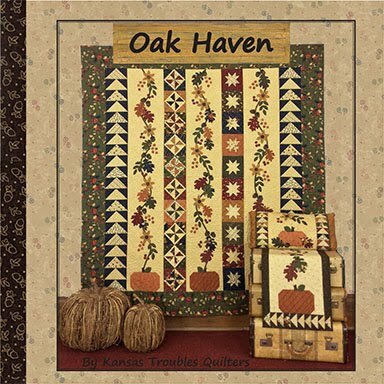 Free patterns for blocks will be posted every Wednesday for 48 weeks. 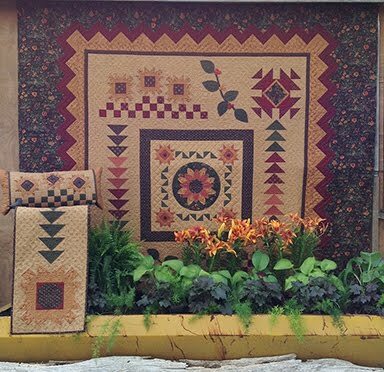 Where can I find the 6" block patterns? 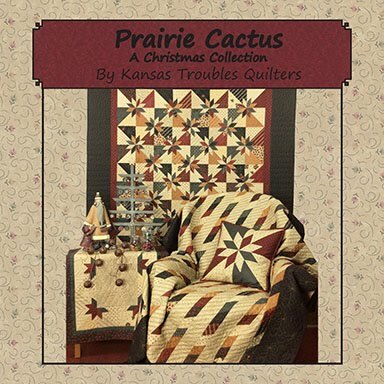 Check here at the Kansas Troubles' blog on Wednesdays for the link to each designer's blog and their free pattern. Each of the 6 designers is offering an assortment of their fabrics as a starter pack. Our KT Starter Pack includes a total of (24) fat 16th's (9"x11" each) - 8 tans plus an assortment of (16) KT darks - for $18 plus postage. Find it on our website here. Have questions? I'll answer you next Wednesday. Comment this week to win a KT Starter Pack! PS- I love this picture Jan Patek put together from our new fabric collection tags. So fun! 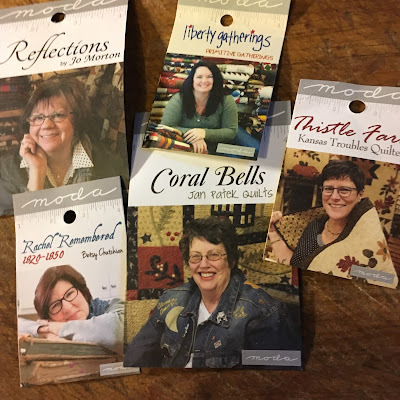 I'm delighted to share the news that six of us at Moda - the designers who love "the dark side" - are partnering to bring you a 48 week long Block-of-the-Week series. 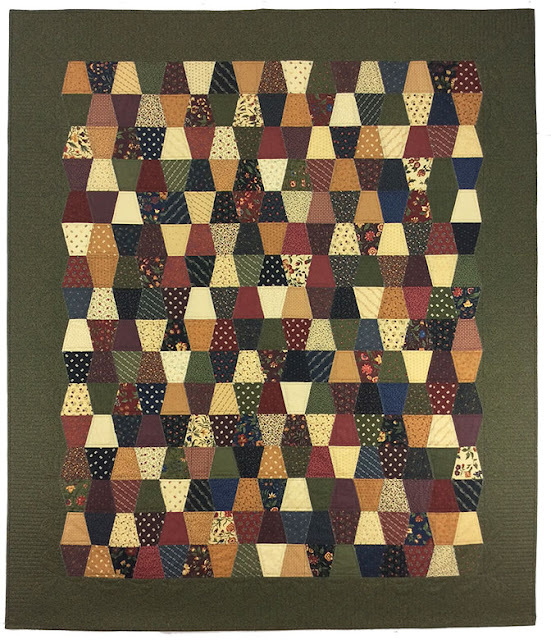 Beginning March 8th, we'll take turns posting a 6" quilt block each Wednesday - just for you. It's so fun to see the variety of blocks the other designers have chosen/designed for their posts. I can't wait to see it all come together! The fun begins with an opportunity for you to add a little to your stash from each of our collections in our Starter Pack. 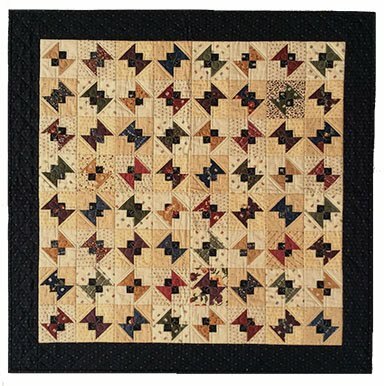 Each of the designers has assembled an assortment of (24) fat 1/16ths (9" x 11" each) to use in making your weekly 6" blocks. 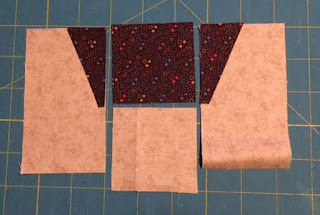 That way, you can follow along and make the blocks from each designer in their fabric OR make every block scrappy with a bit from each designer's collections. I can't decide which way to go, so I'll probably do both! At the end of 48 weeks, I'll have options for setting the blocks with KT fabrics for a totally scrappy dark side quilt. Our KT Starter Pack ($18 + shipping) includes 8 lights and 16 assorted KT darks.Not all packs are the same, but all include some of my favorite small prints for 6" blocks. 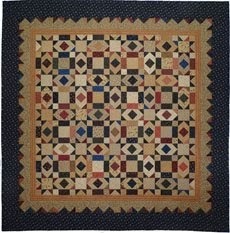 My blocks will be offered as Layered Patchwork every 6 weeks. 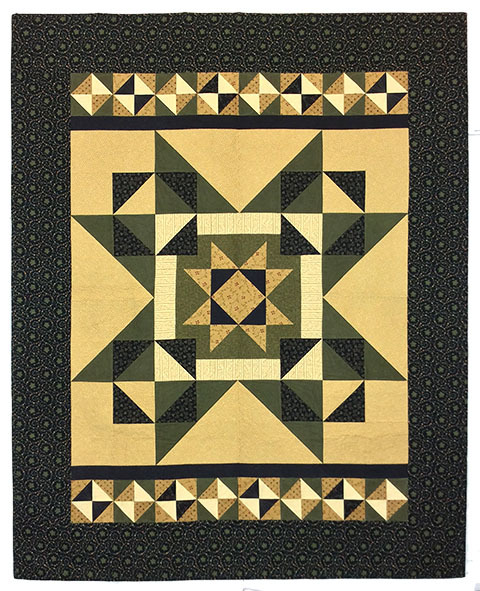 I'm also planning to convert many of the other designers' blocks with my easy, layered technique to simplify piecing. 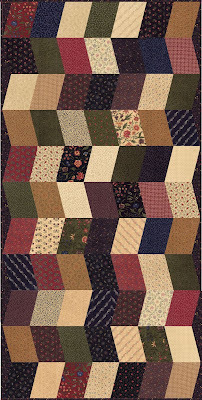 It's a great time to try out Layered Patchwork in a small project. Call KTQ at 785-488-2120 to order now! Here's all the information you need to follow me and the other 5 delightful Moda designers for the 48 week Block-of-the Week. We'll be posting in a 6 week cycle in the order listed below, so follow us on this almost year-long journey. You won't want to miss a week! We'd love to see your blocks as you stitch along with us. Post to any social media sight using the hashtag - #modablockheads. See you all on Wednesday, March 8th. 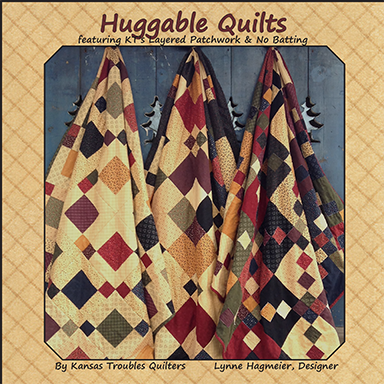 Tell your quilting friends! 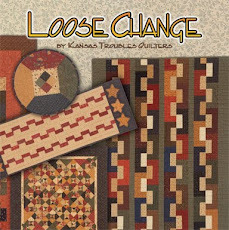 Linda Blodgett - Would love to try out a new ruler. 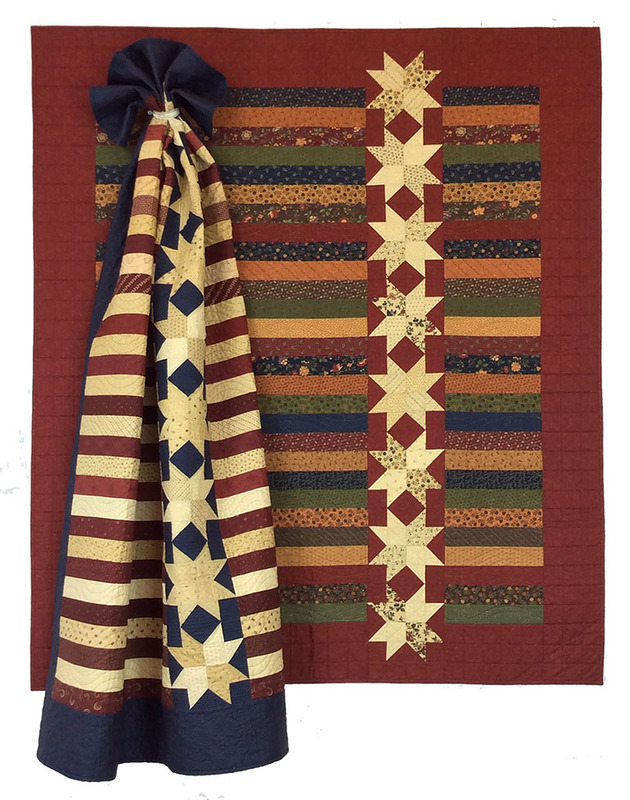 As always, your quilts are eye candy - like chocolate! 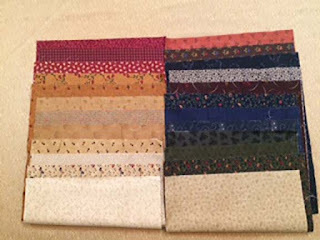 Linda, give Jamie a call with your choice of our KT rulers /templates or email me at lynne@ktquilts.com. Remember all of our KT rulers/templates are 25% thru the month of February. It's a short month, so don't delay! Another cruise is in the books. Jenny and I had a great group of 100 ladies that eagerly tackled anything we threw at them. 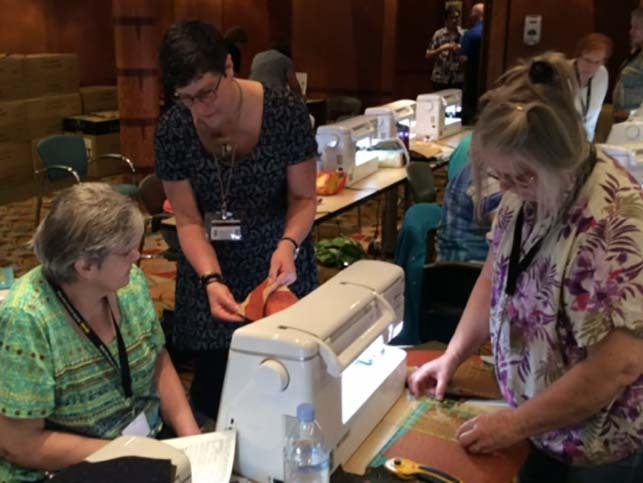 Flash Sew & Quilt was our host, providing Baby Lock sewing machines for every quilter. 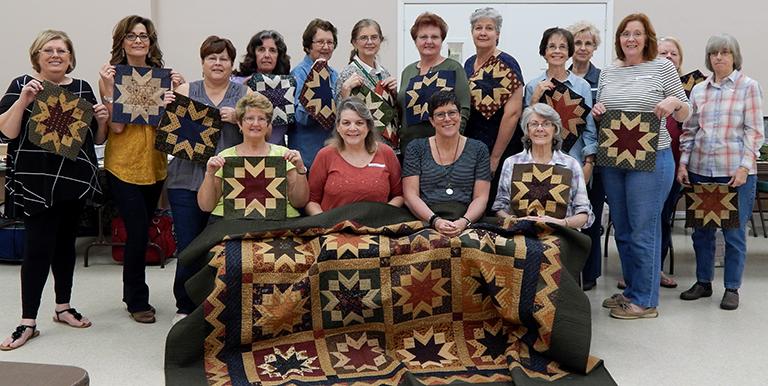 The best part of teaching is having time to hear quilters' stories of family, quilts, sisterhood. Here's a sampling of some of the lovely ladies we shared our week with on the Freedom of the Seas. Thanks again to all of you who sailed with us. It was a relaxing, memorable week. 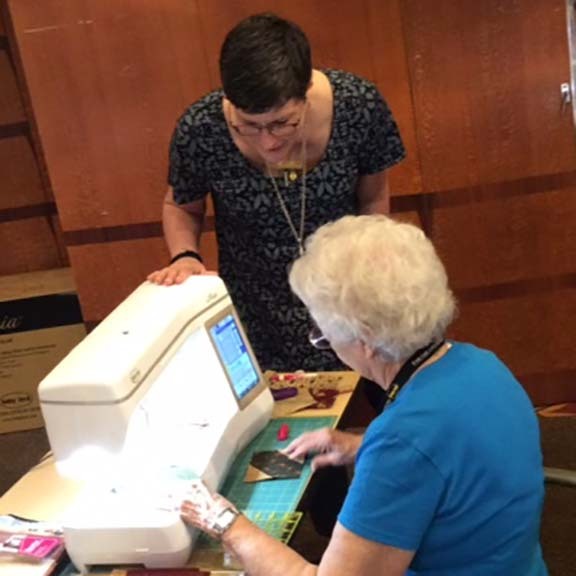 In the pictures above, the ladies were working on the KT Cruisin' Sampler, which is now available as a pattern booklet (as soon as Robert posts in our website). The half day project was our Blooms Mini Table Treat from Bees 'n Blooms. It's now a separate MTT pattern/kit with brand new KT Kut-ups. All the appliques are laser cut with Heat 'n Bond Light fusible web. If you were on the cruise, don't get overly excited. The circles/binding/stem strips will not be precut in the kit like we so graciously did for you. Circles are a breeze to cut with the Cut-a-Round ruler, though. So easy for perfect circles every time. 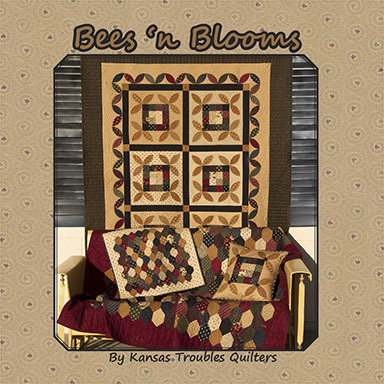 Blooms kit includes fabric for front, back, binding, pattern & Kut-ups pack for $29.95. Add an 18" square of batting for just $2! Comment here with your Valentine's Day plans to win a Blooms Mini Table Treats kit! Happy, Happy Day! 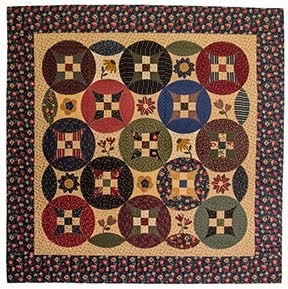 mtquilter -Even though I generally pick a darker palette to work with I love the brights too. I think lime greens and oranges are some of my favorites...throw back to the 70's I think! PS - I said this pattern would'nt be available until after the 2018 cruises, but there are several quilters joining us again next year. So, I'm designing a new project for 2018. 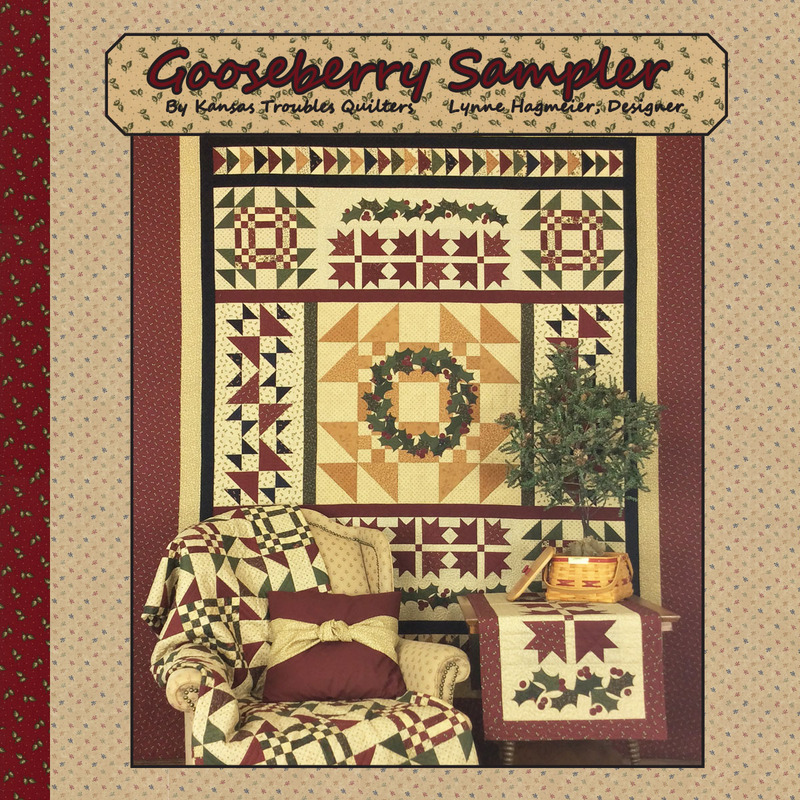 That means, the KT Cruisin' Sampler pattern/kit will be available at ktquilts.com just as soon as Robert is caught up. Interested? Call Jamie today! DebMac - If you ask my children their favorite color; they will tell you plaid. 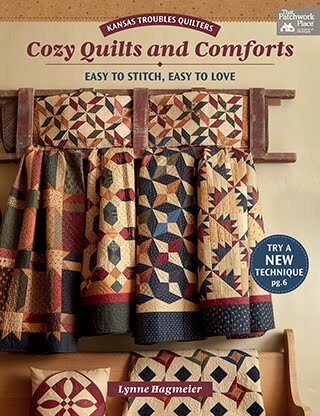 Plaids are a big favorite at my house so I am very happy to see you introduce them to your line. 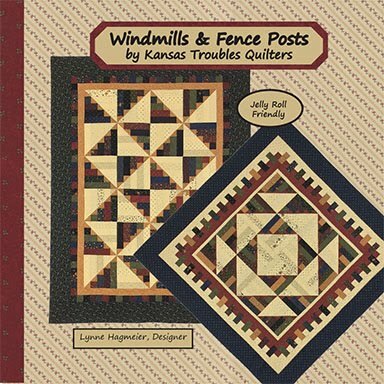 They just add something to a quilt. We had a day to repack suitcases and shop a bit, then onto the Freedom of the Seas for an 8-day quilting cruise with 100 terrific ladies. Funny, the only picture I have from the cruise is of Jenny & I visiting the Caribelle Batik factory in St. Kitts. What an educational, entertaining excursion. 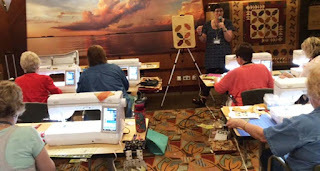 We were able, along with all of quilting friends, to create our own batik fabric with a special stamp dipped in wax. Then we dyed our stamped fabric in bright yellow dye. I'll share my project when it's complete. Jenny & I both found a few treasures in the gift shop and the guys bought cool batik shirts. Best port to visit on this trip! I was pleasantly surprised how many of the quilters finished - or were nearly finished - with their quilts before we docked. I'm so proud of all of them. I can't wait until next year when we teach two cruises back-to-back! Woohoo! Hope you can join us sometime. Watch for an important announcement next week, Wednesday, February 8th, right here. You won't want to miss it!